An all natural supplement that delivers excellent fat and calories to burn for any age horse, from colt to stallion. It helps them maintain proper body weight, muscle tone and improves overall sense of well-being. Engineered to give your horse more nutrients, stamina, a shinier coat, and an overall improved physique. Premium ingredients, including rice bran blended with peanut meal are used. It is a low starch supplement, with an excellent source of Vitamin E, natural minerals and digestive enzymes.This product delivers protein, fat, fiber, carbohydrates, amino acids and host of macro and micro nutrients that will improve overall heath. 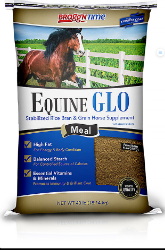 A visible difference in the animal is commonly noticed 3 to 4 weeks of feeding Equine GLO supplement feed. Horses are drawn to the incredible aroma, as well as the taste and nutrition. Their physical response tells it all! This unique blend is highly preferred over just plain extruded rice bran! Safe for younger and older horses, as well as high-performance horses under extreme workloads. A stabilized product and has an approximate 1 year shelf life for freshness.